Traveling through Albania proved extremely difficult. Not all buses leave from ‘official’ bus stations and certain routes are only made by furgons- small vans that only depart when full. We easily spent 3 hours trying to figure out how to get from Berat to Ohrid. There are only a handful of entries on the web regarding this transit and most are a few years old and no longer accurate. Our planned route was to be the following: Take a bus from Berat, Albania to Elbasan, Albania and then a bus from Elbasan to Struga, Macedonia and finally a local taxi from Struga to Ohrid. After walking 40 minutes we were able to catch the 8:40 bus to Elbasan for 800 lek ($6.40 USD). Arriving at the Elbasan bus station around 11:00 we asked around about catching a bus to Struga and learned that there was only one a day and it leaves at 8 in the morning. We knew there was a furgon station (street of minibuses) near the soccer stadium that was our best option. A man at a bus company also told us that we should go there. We decided on a furgon and loaded into the van with 9 other people. Where we were going wasn’t too clear. The vehicle was going to Pogradec, Albania but we requested to get dropped off at a different (closer) location to the Macedonia border north of Lake Ohrid. The ride took about an hour to go a distance of 30 miles. The furgon drove along twisty mountain roads taking an indirect path. To our surprise the driver had understood our English, with the assistance of another planet who spoke broken English and Albanian, and dropped us off at the border further north of where he was taking the other passengers. He dropped us off and left us with our bags at the Albanian-Macedonian border. Confused, and looking like hobos with all of our bags, we aimlessly wondered around. It was rather unclear where people on foot needed to go. We ended up standing in car line and excited the Albabian border with a few cars infront and behind us. Ha! After exciting Albania problem free, we walked the short distance to the Macedonian border. Again in the car line we walked across the border, got our stamps and entered Macedonia. We were officially in Macedonia, but what next? A few sketchy unmarked cabs tried to offer us over priced rides which we briefly considered as the walk to town was 6 miles and we were in an uninhabited area. As we stood defeated looking around for inspiration a middle aged couple pulled up next to us and asked in English where we were headed. They were going that direction and told us to hop in. She made casual conversation with us while driving us to Struga. She dropped us off right at the furgon stop where we needed to get the furgon to Ohrid. She gave us detailed instructions on how to get to Ohrid. We thanked her for the ride and offered her or remaining albanian money- we had no need for it any more,is essentially useless outside of Albania. She first tried to offer us the equivalent amount in Macedonian money but didn't have enough and reluctantly she took our money. The furgon arrived minutes later-great timing! The driver was a cheerful man and spoke great English. English seems to be more commonly spoken here than in Albania. The furgon only had one free seat, so we squeezed in back like sardines with two other women. Quite a cozy ride. The driver though friendly tried to capitalize on having tourists in his van and offered us to stay at his guest house or to pay him to drive us around the following day to the sights outside of the city. People seem a bit desperate here during low season. After a journey of five hours we finally made it to Ohrid! We spent the rest of the day walking around old Town, admiring the views of the lake, and trying a traditional meal for lunch- sausages over white beans baked in the oven. At night the town took on a magical quality. Old churches on hill tops were illuminated and glowing against the black water of the lake. We wondered up and down stone stairs getting lost in more and more beautiful scenery and discovering countless churches. We finally made our way to dinner and shared another traditional meal and salad. We can't get enough of the medditerarian style salads. We spent our second day exploring the town by foot. We hiked up past white Ottoman style homes and continued further into a wooded area to reach the Fortress. From here was a nice view of the three million year old Lake framed by mountains. From Ohrid it was a three hour bus to the capital of Macedonia, Skopje. 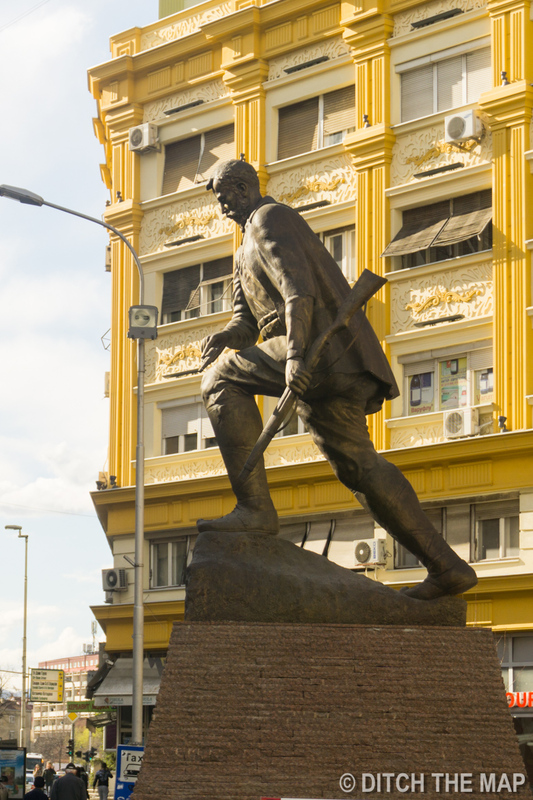 We walked through Skopje to get to our hostel and could not help but notice the surplus of large, gaudy statues everywhere. The statues depict all different figures; lions, bulls, horses, men with guns- their mammoth size makes and puzzling significance making them feel a bit tacky. Grandiose palace like buildings and eastern orthodox churches had an equally populous presence in the city. Skopje is not shy when it comes to extravagance. Despite its flamboyance it is one of the more modern cities we've been to in EasternEurope. It is also less polluted and better maintained than Albania's capital city. We walked toward old town passing the Mother Teresa Museum (she was born in Skopje) and observing mosques within several hundred feet of each other- small, large, old and new alike. One mosque was having an event with over a hundred people gathered outside the mosque. Men and women sat seperately, intently listening to the speaker. From the mosque we walked by the walls of the old 6th century Tvrdina Kale Fortress and continued into the winding roads of old town until we found a Turkish restaurant for lunch. We shared a stuffed pepper and stuffed cabbage- delicious and cheap. We entered the tented maze of the Turkish Bizarre, Bit Pazar, which sells a little bit of anything and everything, to quote Lonely Planet, "fruit, vegetables, stolen phones and household items." A troubling sight around this area of town was the presence of child beggars. Their dirt stained clothing and faces were an upsetting image but even more frustrating is that their parents have put them up to it. A disproportionate amount of the beggars we saw were Roma often refered to as gypsies. At lunch we were approached by a child beggar and in place of money we offered him some of our left over bread to which he shook his head. I suppose this means he is at least not starving. We checked out some of the shops and Turkish bakeries in old town. I tried revani- a grainy semolina flour cake moist with a sweet syrup and acibadem kurabiyesi, two bitter almond cookie with vanilla cream in the middle. Wow, both were delicious! Very sweet and would compliment coffee well. Turkish pastries have very interesting unique flavors, they often use nuts, very little to no chocolate and are sweetened using honey or a sugary syrup. Later that evening we enjoyed traditional Macedonia Food while listening to traditional live music. For dessert we had coffee and cake on the main square gazing up at the towering horse statue in the center of the square. After walking 35 minutes to the bus station to catch, what we thought was, our 9:00am bus to Prizren, Kosovo we discovered that the only bus out left at 16:00 (the website clearly stated 9:00 though!). We spent 7 hours waiting in a nice mall with an attached grocery store. The journey to Prizren is only 62 miles but is supposed to be 3.5 hours. Being on a bus driving through mountain roads is not our favorite way to travel. We were conflicted about going to either Kosovo or Serbia for our next destination because we've read there are some issues relating to entry/exit stamps for Serbia. It's been discussed online that Serbia does not recognize Kosovo as an independent nation and that if one enters Serbia via Kosovo that the Serbian officials will refuse entrance and claim you have 'entered' Serbia illegally. We are going to try to cross into Serbia straight from Kosovo but we are getting ready with a backup plan if we have to backtrack through Macedonia in order to enter Serbia. We'll have to get an early start that day to give to provide us with enough travel time if Serbia rejects our entrance. There is nothing about a traveler being successful in what we're about to try online--however most (read probably all) claims of not being permitted entrance to Serbia are likely anecdotal. Keep your fingers crossed for us!